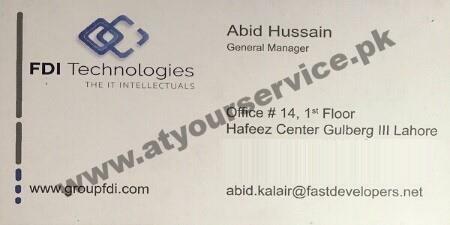 FDI Technologies is located in Hafeez Centre, Main Boulevard Gulberg III, Lahore. It deals in IT & telecom consultancy, data center solutions, Operations & Maintenance, system integration and end to end solutions. FDI Technologies provides brand agnostic solutions in the domains of Structured Cabling, Data Network and Security, Unified Communication, Enterprise Software, Enterprise Servers and Storage, Services and Maintenance.